This book presents six vignettes, from the Bronze Age to the present, in the history of international trade across six continents. The background information for the poetry comes from economics and anthropology texts. The structure of the book is full of cultural information as well, representing a combination of Western businessman and indigenous inhabitant. The poems are hidden within six silkscreened and die-cut regimental ties, from regiments sent to colonial territories of Britain, bound in a panorama format. Only the word “pull” is visible at the top of each tie. When the white interlining is pulled up slightly from its armature, the words gradually appear. The text is not chronological. It travels East, starting with the Wahgi in Papua New Guinea. Subsequent stops are made in the Pacific at the Marchesan Islands, South America, Africa, the Middle East, and East Asia. The reverse side of the book shows four die-cut rectangles in the shape of tie labels. Once again, the interlining of the ties shows through, this time displaying four words: RUBBER, SILK, COTTON, and COPPER. The importance of textiles in trade from prehistory onward cannot be overemphasized, and copper, Africa’s most important mineral export, gave rise to the Age of Electricity, enabling trade to advance at lightning pace via the telegraph. But when the interlinings are pulled up again, they form the colophon. Rubber becomes “Rubber stamp and” “silk screen on” “cotton rag paper with” “copper wire and raffia binding.” Copper wire was even used as currency in West Africa, so in a sense, the book is bound with money: hand-made staples of pinstriped copper electrical wire. The rubber stamp text is printed in the typeface New Caledonia, a place once visited by James Cook and later colonized by the French. The ties on the ends lacking die cuts mimic patterns for customers of made-to-measure ties, with the signature of the artist in place of the name of the tie customer at right, and the number in the edition in place of the tie width at left. The edition is of 30 copies, a reminder of the Thirty Years War in 17th century Europe, when the Croatian mercenaries fighting for France introduced a new form of neckwear to the battlefield which did not require starching or elaborate tying procedures. The French officers wore them back home to court and the modern necktie was born. The bottom part of the ties, in essence what is visible here, is known as the blade in Britain or the apron in the U.S. The back of each blade is silkscreened with a shiny Prussian blue ink, which shows off the herringbone grain of the paper. The “seam” is printed with the same ink and perforated by hand with a tailor’s sewing wheel used to mark patterns. The herringbone patterned paper is actually titled “tweed” in the Savile Row line of paper propitiously produced in the spring of 1997 by Cartiere Fedrigoni. 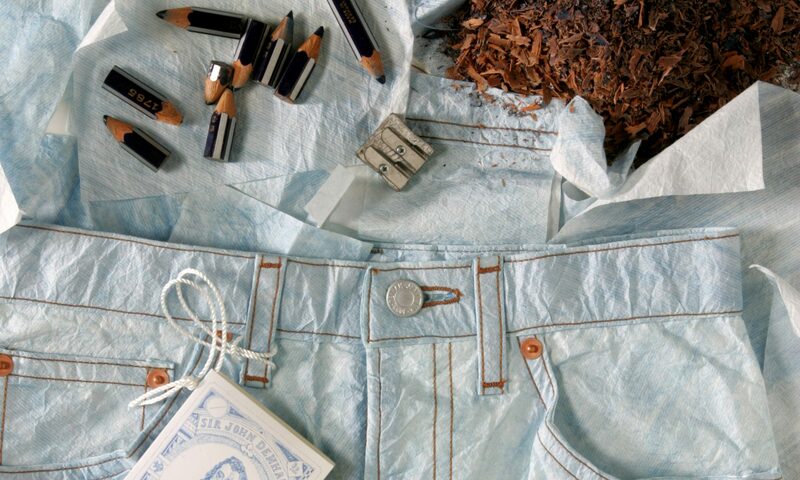 The paper, which comes in tweed, plain, and pinstripe, is actually made from recycled scraps from the garment trade as well as new fibers. Savile Row is the street where conservative businessmen order their suits and ties, but the tweed pattern, enlarged, is repeated on the front of the book by the diagonal stripes of the regimental ties. The same pattern is created when feathers are placed side by side, as they might be on an indigenous feather skirt or a feather headdress. The “apron” of the tie is not a misnomer: the book may be worn as one with raffia “ties” to secure it around the waist, or may be tied around the crown of the head. The idea of mixing indigenous dress and neckties is not limited to this book. In doing research for the text, the artist discovered indigenous people from Fiji and Papua New Guinea wearing ties with native dress in photographs. 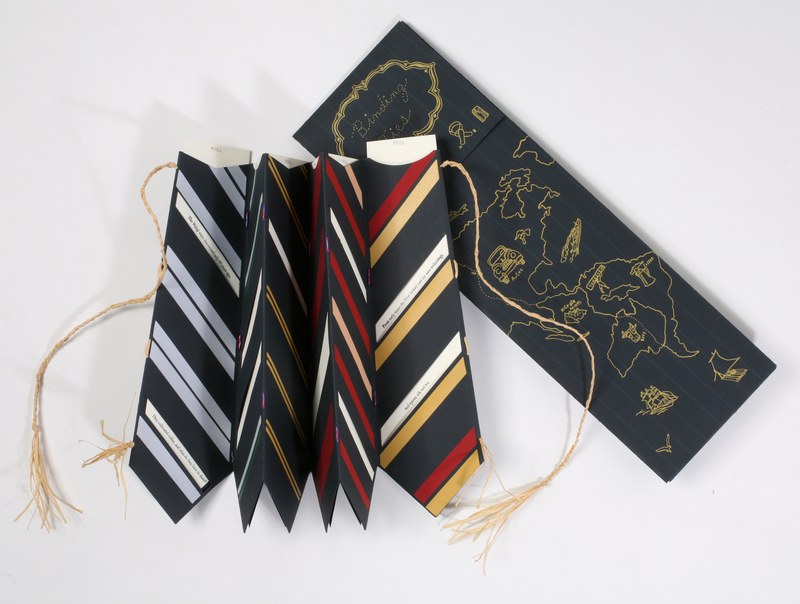 The case is structurally based on the envelopes in which ties are sold in Italy, with a raffia braid in place of a ribbon tie. Most of the imagery was drawn from the 1942 Parker Brothers “South American Trading Game” found at an antique store in Maine in 1990. This game taught young North Americans what raw materials to extract from each country and what finished products to sell. The imagery that did not originate with the game comes from the artist’s extensive ephemera collection, including Victorian cut-outs of exotic animals. The vertical lines of the Fedrigoni pinstripe paper serve as the longitude lines on the world map, while suggesting a business suit at the same time. An original silk tie sample collected by the artist from the tie manufacturer P.L. Sells in East London is glued inside each top flap, with 15 different regiments represented, all from former colonies. 17th/21st Lancers, Royal Corps of Signals, Colonial Police, Irish Guards, Calcutta Light Horse, and Kenya Police. VIEWER BEWARE: The blades of the ties will spear through the bottom of their sheath if they are put point down. Published together with Sintesi Edizioni, a press created by Guido Tucci dedicated to producing artists’ books in Bologna, Italy. The Wahgi were discovered only 60 years ago. They cultivated coffee, and what do they have to show? Fish in tins and rice. Putting owners out of sorts. So islanders hid them out of range. Complicating barter from the western end. Initial exploitation was not always such. What might have seemed meager, may have been much. From both native and western side. The raw went out and manufactured came in. Foreign resource to extract, manufacture, then sell back. Turn the steel into automobile, lay the railroad track. Breaking up overland ways, calling for ivory and slaves. The Bronze Age begins with copper and tin. Catalyzing change and exchange of all kinds. Onward to Turkey by caravan. Donkeys were loaded with textiles and tin. Goods and ideas came out and went in. And spices, silk and tea. And Asia sent out pleas. When the east trade winds again shifted their ways.